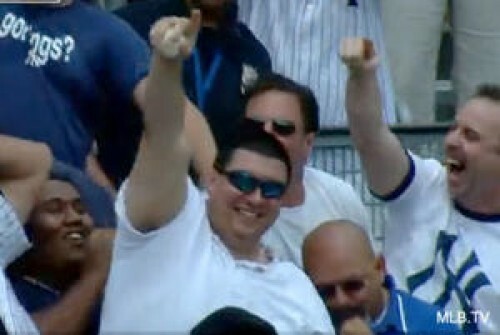 How often do you go to a baseball game and how often do you catch a ball that goes into the stands? Not too often I suspect. Some get lucky, some get foul balls. I once went to the bathroom and when I came back, by buddy Neil was holding a Mike Gallego foul ball. I missed it by 30 seconds. The point is, it's hard to do and you need to be at the right place at the right time. Sometimes, you hit the motherload and catch Derek Jeter's 3000th hit, which happened to be a home run. Christian Lopez did it and we were able to ask him a few questions about the ordeal that no one asked him. 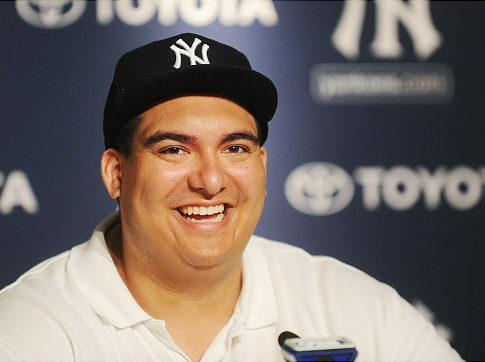 It's almost a "What you didn't know about Christian Lopez and the Jeter 3000th ball" Interview. Anyway, Bleeding Yankee Blue was excited for Mr. Lopez when he got the ball, but then, when the tax man came knocking, we felt bad and in support of Mr. Lopez, we put ads on our site supporting the companies that stepped forward to help pay for Christian's tax bills. But we found out a very interesting yet unfortunate development. It turns out, according to Mr. Lopez, not all the companies stepped forward. Miller High Life, where are you? That is disappointing. Take a moment and check out our interview with a new pal of the Bleeding Yankee Blue family, Christian Lopez. BYB: When you caught Jeter's 300th hit baseball, everyone knows you met and returned the ball to Derek Jeter, but what happened between the time you caught the ball and meeting him? Describe the sequence of events? Christian Lopez: Well, as soon as I caught the ball I don't believe 15 seconds went by before security whisked my dad and I away. I was then brought to Yankee Security and that is where I met the head of team security for the Yankees. It was there where I decided to give the ball back to Mr. Jeter. After that, I was introduced to Mr. Levine and Mr. Cashman, as well as dozens of other people that run the day to day operations. Then, the next thing I knew, I am on YES with Michael Kay and John Flaherty and that was the first time I have ever been on TV. After that, I was on the radio with John Sterling and Suzyn Waldman which was exciting! I was then interviewed by the Yankees and that was the interview they played during the 7th inning stretch. After all the interviews, I went to "The Boss's" suite which was absolutely incredible and I met so many people. After the game was finished, I went down to the clubhouse and as I was waiting to meet Mr. Jeter, "Mr. October", Reggie Jackson showed up and was joking around with us for a good 10 minutes. I also met Jay-Z because he was waiting to see the man of the hour as well. I spoke with him for a couple of minutes too. As soon as we entered the clubhouse, Mariano Rivera came up to me and started talking to me for about 5 minutes and thanked me. He said some words of encouragement to me which as a fan, to have a man of his caliber tell you how much he appreciated you, really meant a lot. 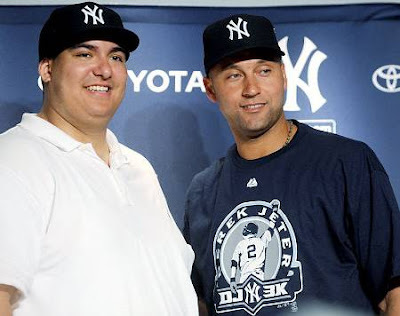 After I spoke with Mr. Rivera, that was when I met Mr. Jeter. Which to me, is still unreal and a memory I will never forget. BYB: Did you at any moment think of keeping the ball? Christian Lopez: No. When I was asked the question about what I wanted to do with the ball, I thought to myself "What would I want someone to do for me if I were in the same situation?" The answer was clear to me. 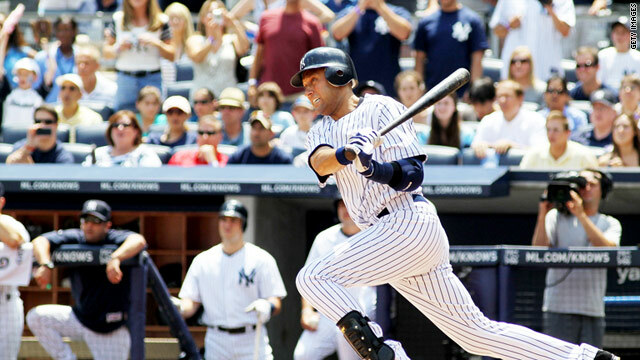 Mr. Jeter has a laundry list of accolades and deserved to have the ball that he hit back. BYB: We here at Bleeding Yankee Blue have listed the companies who publicly offered to help you with your tax mess on our home page. We found your returning the ball very touching and unselfish. Good for you. Have any other companies come forward to help you? Christian Lopez: The only 2 companies that have stepped forward have been Mitchell Modell, the CEO and President of Modell's Sporting Goods and Brandon Steiner, the Founder and President of Steiner Sports. BYB: What did the Yankees and Jeter do for you after that historic 3000th hit? 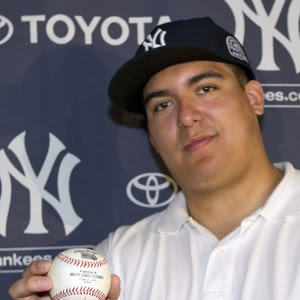 Christian Lopez: Well, I received tickets and memorabilia from the Yankees. And as for Mr. Jeter and I... that is between us. BYB: Describe the Captain Derek Jeter and your meeting with him? Christian Lopez: Meeting with him was a once in a life time experience. He is extremely humble and a down to earth guy. Due to everything going on with that day and his personal agenda with his family, we didn't get to spend much time together, but the time we did talk was awesome. BYB: Have any of the other players reached out to you since your famous catch? Christian Lopez: I have met a bunch of the players past and present and they have all been really nice about it and keep telling me that I did a great thing. That means a lot coming from them. Thank you very much for taking the time to talk with us Christian. I also want to thank Beth Hucke for helping Bleeding Yankee Blue get this interview. We truly appreciate your help. --Beth Hucke- BYB Guest Writer & Creator of We Want Nick Swisher to host SNL on Facebook.